What happens to the water happens to the people. June 27th 15 hours, 36 minutes daylight, 19 minute daylight gain No wonder the kids won’t go to bed! DIRECTIONS: Coldwater Springs is between Minnehaha Park & Fort Snelling, in Minneapolis, just North of the Hwy 55/62 interchange. From Hwy 55/Hiawatha, turn East (toward the Mississippi) at 54th Street, take an immediate right, & drive all the way down on the frontage road where you can park at the pay meters with a credit card for $1/hour. Smart to pay for 2 hours. Gather at the park entrance. Contact Superintendent John Anfinson, email or phone 651-293-8432 with concerns about no public parking. Dress for the weather, especially sturdy footwear. We celebrate the full moon in all weather however the length of the walk depends on conditions. 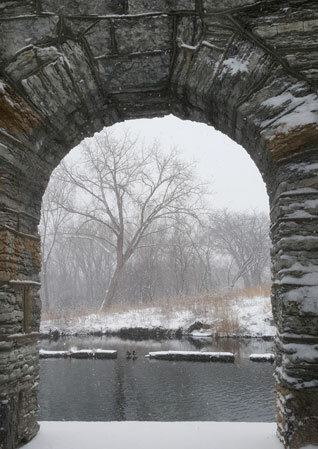 If it’s really cold or wet it’s a quick 10-minutes from the parking lot to the spring outflow gurgling from under the limestone bedrock Spring House built in the 1880s to supply potable water to Fort Snelling. This gathering is free and open to the public. A beautiful solstice moon walk and sitting upon the springhouse a friend stopped to forage just atop the hill. PLEASE NOTE: THIS IS A QUICKTIME FILE. QUICKTIME MUST BE INSTALLED AND ENABLED TO LISTEN. Hear John Anfinson of the National Park Service declare "We begin history here in 1820." In 1820 U.S. Army troops marched up the Mississippi bluff to Coldwater Springs, assumed control of the land and water, and mined limestone out of the hillside to build Fort Snelling. Coldwater Springs has been flowing more than 10,000 years and still flows at 80,000 to 90,000-gallons a day. Coldwater is half way between Minnehaha Falls and the confluence of the Mississippi and Minnesota rivers; it is part of the Dakota genesis story and considered sacred. In 2010 the National Park Service took over Coldwater's 27-acres with the congressional mandate to restore it as public parkland. In December 2011 park officials had the area clear-cut including indigenous cottonwoods, maples and sumac bushes. The 2006 and 2009 NPS Environmental Impact Studies included airport rules and maps delineating runway rights-of-way where "no new trees" can be planted. 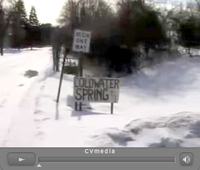 KFAI producer Allison Herrera explores the history of Coldwater Springs in this exclusive MinneCulture documentary. The giant willow by the source of historic Coldwater Spring has been cut down. The National Park Service removed the tree claiming it was a hazard and could damage Coldwater reservoir. The tree was also showing its age with decaying wood, cracks and weak branches. The spring has been there an estimated 10,000 years and was long a sacred site for the indigenous peoples, probably preceding the current Anishinabe and Dakota people. It was once Camp Coldwater, an adjunct to Fort Snelling. Troops and settlers were quartered there and water was hauled down to the fort, with a pumping system deployed in later years. It was a source of water for the fort from 1820 to 1920. From the 1950s to 1991 the Coldwater property was a Department of the Interior, Bureau of Mines research center. The site was transferred to the Park Service in 2010. When MnDOT rebuilt the Highway 55/62 interchange they did so without the required environmental assessment, claiming that they would prevent any harm to the spring. Their construction caused a loss of more than 27,500 gallons a day. The spring is currently flowing about 90,000 gallons a day. Susu Jeffrey, founder of Friends of Coldwater, led a Full Moon Walk on August 13, 2011, to visit the old willow before it was cut down. She has lobbied, worked and written for the preservation of this historic area. Visitors sprinkled a circle of corn meal around the tree, celebrating its life and vitality. Some branches were clipped to be sprouted for future descendants of the tree. Plans for development remain uncertain as the nation wrestles with budget issues and a group in Congress wants to defund the National Park Service. Thus the sacred spring and its environs are left in disarray. Subject: Removing "Sacred Willow Tree at Sacred Site"
The Dakota people who respect and honor our Sacred Sites and the natural vegetation surrounding these sites (which include specific sacred trees such as our willow trees!) and in particular the Sacred willow tree at our Dakota Sacred site Coldwater Spring, are requesting you grant the wish of our elders and spiritual leaders to put a stop on cutting down our Sacred willow tree at Coldwater spring. As you should know by now the Department of Agriculture and the National Park Service met last March 11th in Phoenix, Arizona, with many Spiritual leaders and Elders to include new rules and guidelines for the protection and use of Sacred sites and the natural plant and tree medicines to be used by the indigenous of this country. We ask that you call and stop this willow tree removal immediately. This message will be sent to all our spiritual people across the country. Friends of Coldwater Comment on the FEIS for the Coldwater/Bureau of Mines Property. We support National Park Service/Mississippi National River and Recreation Area management and ownership of Coldwater for all peoples. Traditionally the Coldwater area was a "neutral, sacred" place where all nations gathered together and gathered water for ceremonial use. 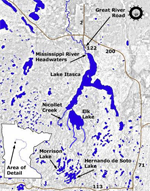 Expand Coldwater Park (27 acres) to include the adjacent Veterans Administration blufftop parcel (23 acres) and the Minnesota Historical Society bottomland (21 acres) to form one contiguous park linked to the National Park Service Island (108-01) in the Mississippi directly below Coldwater (see attached map). Coldwater is an ancient geographical feature, predating human habitation here, and is the last natural spring of size (90,000 gallons per day) in Hennepin County. We urge designation of the Coldwater property as America’s first Green Museum, a place where the land itself is the museum, the teacher. Special designation would add protection since the surrounding area is highly developed and slated for more development. After removal of Bureau of Mines buildings and structures, replanting and stabilization of the land, the enduring crucial aspect of “ownership” of this last natural spring in Hennepin County will be to preserve and protect the source water and the underground pathways of that water to the spring outflow. Unlike other watershed districts in Minnesota, Coldwater's source waters are separated administratively from its outflow and discharge into the Mississippi. Responsibility from source to mouth should be assigned to the Minnehaha Creek Watershed District, the agency that sued MnDOT to force a redesign of the Highway 55/62 interchange that threatened 30-percent of the flow to the spring as measured by dye tests. Retain the Spring House and reservoir (pond) as-is to "partially reflect more than one period in history." Also since the greatest outflow of spring water is at the northwest corner of the Spring House, removing the Spring House with its shade could damage the outflow. During the Bureau of Mines period when the property was fenced and closed to the public, Coldwater was used as an emergency drinking water supply for south Minneapolis. “In 1976 after months of drought the city water developed an algae that was putrid and undrinkable by my husband who was very sick at the time. I made trips every other day to Coldwater Spring and stood in line to get the best tasting fresh water. We were so thankful for this vital resource. If it is still not polluted it should be a National Treasure!” (Carolyn K. Lyschik, 13805 Glasier Lane, Little Falls MN 56345, written statement dated 10/21/06, [month and year certain, date hard to read] original included with DEIS comments). With a worldwide clean drinking water crisis and climate change it would be wise to preserve our county’s last natural spring. Coldwater Spring has been flowing for 10,000 years, experts say, even under the last glacier. The 27 acre Coldwater campus is located atop the Mississippi River gorge, between Minnehaha Regional Park and Fort Snelling State Park, just above the confluence of the Minnesota and Mississippi rivers. Coldwater furnished water to Fort Snelling for a century and still flows at about 100,000 gallons a day. Coldwater is the Birthplace of Minnesota, where the soldiers who built Fort Snelling lived (1820-3) and where a civilian community developed to service the fort. Those settlers founded Pig's Eye (later St. Paul), St. Anthony, Minneapolis and Bloomington, setting the stage for Minnesota statehood in 1858. Friends of Coldwater envisions Coldwater Park as an 80-acre urban wilderness, from the top of the Mississippi gorge to the riverAmerica’s first Green Museuma place where the land is the legacy, the museum, the teacher and the future. • Coldwater Spring is at least 10,000-years old. It is the last major natural spring in Hennepin County. • Where Coldwater Creek and waterfall empty into the Mississippi River the sandstone bedrock is 451-million years old. • At the top of the bluff where Coldwater Spring flows out of bedrock fractures, the limestone is 438-million years old. Everything after that time was scraped south by glaciers (which is why there are no native earthworms). • Mni Owe Sni (Dakota: water-spring-cold) located above the confluence of the Minnesota and Mississippi rivers, was a traditional gathering place for Upper Mississippi Indian peoples including Dakota, Anishinabe, Ho Chunk, Iowa, Sauk and Fox (within historic memory). Particularly blessed by water and considered sacred was the 2.5-mile stretch from (what is now called) Minnehaha Falls through Coldwater to the b’dota, the meeting of waters (confluence). • Coldwater became the Birthplace of Minnesota when army troops camped around the spring (1820-23) and mined limestone bluffs to build Fort Snelling. Pioneers built cabins at “Camp” Coldwater to service the fort with meat, trade goods, whiskey, translators, guides, wives, domestic workers and missionaries. Coldwater furnished water to the fort from 1820-1920. • From the 1880s to 1950 “Coldwater Park” was labeled on area maps. • The Bureau of Mines built a Cold War facility to research metallurgy and mining on 27-acres around Coldwater, 1950-95. • In 1988 the US Congress established the Mississippi National River and Recreation Area, under the National Park Service. MNRRA is a 72-mile long spaghetti-shaped parcel of critical habitat along the Mississippi River through the greater Twin Cities from Dayton to below Hastings. Coldwater could become the jewel of MNRRA. • Coldwater still flows at about 80,000 gallons a day. 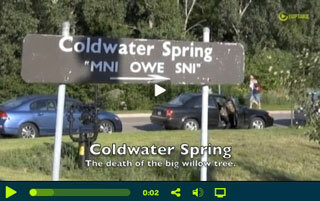 A video by Sid Pranke and featuring Friends of Coldwater founder Susu Jeffrey. Take a short video tour of Colwater. Coldwater is a 10,000-year-old spring that flowed at a pre Highway 55 construction rate of 100,000-144,000 gallons a day. In addition to being a living geological museum, Coldwater was a traditional gathering place for Native American tribes of the upper Mississippi that used spring water for specific ceremonies requiring sacred water in a sacred landscape. The powerful Dakota god of waters and the underworld is said to dwell at Coldwater Spring. Coldwater is also the birthplace of Minnesota, where the soldiers lived who built Fort Snelling and site of the pioneer settlement whose citizens founded St. Paul and Minneapolis. Coldwater furnished water to Fort Snelling for 100 years. Ducks at Coldwater Spring January 6, 1998. Before it was a historic site, Coldwater was a sacred site. Coldwater Journal is a record of personal observations and reflections from visits to the Coldwater campus. Please feel free to submit your thoughts and reflections about Coldwater, via email, for posting here. Waiting for the March full moon to rise through the clouds we heard, and then saw, two Canadian geese flying northeast. Wow! The geese are returning, it really is Spring. A few minutes later two more geese came honking above us flying to the northwest. We anticipate the great flying Vs but “the people” fly-in after the scouts do their scouting. Hail and welcome Scouts! Yo! We are delighted, nay thrilled at your return. I was tapping my way through one of those tiresome online enviro surveys designed to boost, in this case, the Sierra Club when I simply hit the X button. The US Department of Defense is the world’s largest polluter. Duh, folks! The US military is the greatest petrochemical user. Despite photos of dirty air in Beijing or fires in the Amazon rain forest or in California, the American military machine with 1,000 foreign military bases in more than 170 countries staffed by 199,485 “personnel” with nearly 2-million more at home (not including civilians) is the dirtiest little secret in the world. “Little” because it is so little reported. So why doesn’t the Sierra Club or 350.org talk about military pollution fueling global climate chaos? Because it is a threat to their funding. All our nice friends would lose their non-profit jobs with benefits. Every culture traces its history back to a mythological flood. Seems like the glaciers are melting again. Two-hundred-million people live along the world’s coastlines. It’s about watertoo much or too little, wrong temperaturewhatever. There is no life on earth without water. Not simply “water” people require clean water. The only water safe to drink is cleaned and nutrified by percolating through soil where impurities are filtered out and minerals from rock are picked up. That is spring water, water that seeps directly out of bedrock. “Spring water is sacred,” says Dennis Jones of the University of Minnesota’s Indian Studies Department. Tap water is processed water, only fit for human consumption after mechanical cleaning and chemicalizing. And thank goodness because we all drink it. But what happens if the process breaks down, is overwhelmed? In 1805 Lt. Zebulon Pike paddled up the Mississippi to see what the Louisiana Purchase (of 1803) had purchased. He “treated” with Dakotas and for $200 of gifts (and 60 gallons of whiskey) he assumed possession of 100,000-acres, nine-miles on either side of the Mississippi-Minnesota confluence up to the great falls, for the establishment of a (as in one) fort. Then nothing except the usual fur trading until1819 when Euro-American soldiers were ordered to establish a fort at the confluence. At Fort New Hope on the Mendota side of the B’dota, the meeting of waters, one-of-five of the troops perished due to “unsanitary conditions” over the winter of 1819-20. They were using river water. A Dakota gentleman showed Lt. Col. Henry Leavenworth’s troops Mni Owe Sni, Coldwater Springs. Or, soldier-scouts discovered an Indian path atop the Mississippi gorge to Coldwater. The military simply expropriated the water source pouring out of the bluff a mile upstream of the confluence. From 1820 to 1880 they carted barrels of the spring water in constantly cycling water wagons and then piped it to Fort Snelling until1905. It was a military takeover. 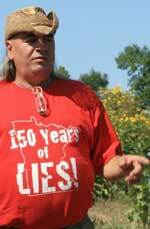 Pike’s treaty was never legally proclaimed and has never been tested in the courts. In 2001 our federal 1805 Dakota Treaty Rights case ended with dismissal of “failure to obey a legal order.” Lead defense attorney Larry Leventhal joked that the order wasn’t legal. It was the third 1805 treaty rights case that got wiped from the federal courts which seem reluctant to return Minneapolis, St. Paul and Bloomington including the Mall of America and the Twin Cities airport land to the Dakota. Of the four major springs in Hennepin County, Coldwater is the only natural spring remaining. 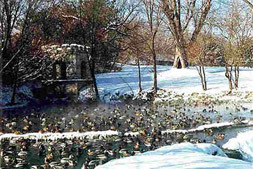 The Great Medicine Spring in Theodore Wirth Park and nearby Glenwood Spring were permanently dewatered in the late 1980s with construction of Interstate-394 west out of Minneapolis. Two and a half-million gallons of groundwater per day are syphoned into holding ponds and then piped away and dumped into the Mississippi by the Stone Arch Bridge. The William-Miller Spring in Eden Prairie comes out of a pipe on the downhill side of Spring Road. Coldwater is what’s left of nature’s gift of clean water here and it is polluted with road salt. For insurance purposes the National Park System has posted scary DO NOT DRINK notices. Do not drink the water that comes out of the pipe on the reservoir side of Coldwater. The sacred water flows directly out of the limestone bedrock inside the northwest corner of the Spring House. In 1999 Coldwater measured 130,000 gallons a day. Now it’s down to about 66,000 gallons a day. It’s hard to jump down into, and out of, the Coldwater Spring House and humbling to bend over and collect the water pouring out of the earth. It tastes rich with calcium and magnesium. It’s clear and cold. It’s the last big flow of sacred water in our county. Mni Wiconi (pronounced wi-cho-nee), water is life. Consider the awesome geography of the confluence of the Mississippi and Minnesota rivers beneath towering cliffs carved by glacial melt waters. Just upstream on the Mississippi, Coldwater Creek outflows, then Minnehaha Creek and nine miles upstream, the great falls now called St. Anthony. The Dakota consider Bdote their place of emergence as a people. Like the Biblical Garden of Eden, the Dakota place of genesis is a spring in a garden which parts into major rivers. It is not a dot on the map but a region that provided food, shelter and all the good things of life. Coldwater is the last major natural spring in Hennepin County. “Camp” Coldwater was the Birthplace of the State of Minnesota, the first Euro-American settlement in our state. Before the Louisiana Purchase (1803) and European expansion across North America, Coldwater was a traditional gathering and ceremonial site for Dakota, Anishinabe, Ho Chunk, Iowa, Sauk and Fox nations. Coldwater: Sacred Site or Military Monument? The National Park Service (NPS) is imposing its vision of Coldwater Springs by recreating the landscape and the history of the place. "Spring water is sacred," says Anishinabe teacher Dennis Jones. In 2006, the Lower Sioux of Morton declared Coldwater "and the land that surrounds it" to be a Traditional Cultural Property (TCP) and "sacred." NPS limits TCP designation to that one Dakota tribe, not all Dakota. Collecting water at Coldwater is a humbling experience. You want to fill your jug at the precise place where the water exits out of bedrock. First, leave an offering, then bend over double, and just below your feet feel the water gushing out. “We begin history here in 1820,” John Anfinson said in a KFAI radio interview. Chief of natural and cultural resources for the National Park Service (NPS), Anfinson is the architect of the Coldwater Park redux. In 1820, U.S. soldiers took possession of Coldwater Springs and harvested limestone out of the Mississippi gorge to build Fort Snelling. They harvested oaks for firewood. Jim Redsky Anderson, chairman of the Mendota Dakota Community, speaking at the opening of Coldwater Park. Dakota people showed Mni Owe Sni (water-spring-cold) to Lt. Col. Henry Leavenworth, who had lost 20% of his troops the previous winter due to unsanitary practices at their camp on the Minnesota side of the confluence. The Dakota welcomed soldiers who would buffer Anishinabe threats and allow Dakota people to trade for guns and other European goods. “It’s like bringing Walmart in,” a Dakota man said. Coldwater furnished water to Fort Snelling for a century, from 1820 to 1920. By the late 1830s, the army was forcibly evicting Swiss, French, Canadian, Irish, English and African pioneers, as well as Native Americans from the fort in order to preserve firewood and game. The Whiskey Wars and settler pressure were threatening fur trade profits. Link to the State Historical Preservation Office and the Memorandum of Agreement on Bruce White’s website. We don't know the names of the Native American peoples who lived around Coldwater Spring after the last glacier melt 10,000-years-ago. The Dakota people were there when soldiers camped at the Spring while building Fort Snelling (1820-3) above the confluence of the Mississippi and Minnesota rivers. The Spring furnished water to the Fort 1820-1920 and still flows at a reduced rate of about 80,000 gallons per day. During the drought summer of 1976 when city water tasted putrid, Coldwater was an emergency drinking water supply for south Minneapolis. Friends of Coldwater (FoC) was founded in 2001, on the shoulders of Park and River Alliance, Stop the RerouteSave the Park, and Preserve Camp Coldwater Coalition as the movement to save this historic land and waterscape changed with passing time. In January 2010 the National Park Service/Mississippi National River and Recreation Area (NPS/MNRRA) began managing the 27-acre Coldwater property. Friends of Coldwater is one of the consulting parties to the NPS/MNRRA Memorandum of Agreement to transition the property from industrial research campus to open parkland. Since February 2011 we have been asking, repeatedly, to see the plans before plans are finalized. 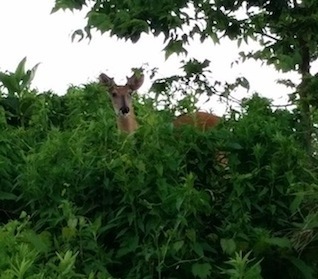 It is the frustration of arbitrary tree removal, toxic chemical application and recent land damage that leads us to the extraordinary step of writing to the regional director of the NPS. The Mississippi River gorge is the only true river gorge on the entire 2,350-mile length of the river. The gorge runs between the confluence of the Mississippi and Minnesota rivers, northward to the Falls of St. Anthony and is 1,273-feet deep according to a sign in Minnehaha Park. But it's invisible to us, filled with glacial debris and under water because dams keep the river level artificially high enough for barge traffic9-feet deep in the shipping channel. The old stories of being able to walk across the Mississippi meant that in low water periods, people could cross the rocky river course atop 1,273 feet of rocks deposited by the glacial melt about 10,000-years ago. The rocks that fill the gorge were brought south by glaciers that dropped their loads in the melt outwash. The glaciers ground up and pushed granite rock from the Canadian shield in (what is now) northern Minnesota southward, mixed with any other bedrock the ice mountain could scour. A truck load of Mississippi River bottom pebbles, from dredging to keep the barge lane clear, was dumped in a friend's yard for their rock circle. The rocks are free, truck delivery is the only charge. In their circle are the tumbled remains of the earth history of this area: black granite, red stones rich in iron, white-ish limestone, milky quartz, a few pieces of sandstone, an occasional agate, and many composites. Each small stone is as individual as a person. Rock wise, the river bottom doesn't look like the great, steep bluffs carved by the Mississippi. This is the "upper" Mississippi, the river is still on top of bedrockconsidered a young river. Further south, the Mississippi meanders through layers of silt, an old river characteristic. From Cairo, Illinois, where the Ohio empties into the Mississippi, down to New Orleans, the river meanders through a sediment-filled valley 40-70 miles wide that used to be an embayment of the Gulf of Mexico. Derivation of Mississippi is traced most specifically to the Ottawa tongue, in which it is Misses Sepe. Variations of this in other dialects are Metha Sepe (Shawnee), Meche Sepe (Kickapoo), Mecha Sapo (Sac), Mecha Sapua (Menominee) and Meze-Zebe (Chippewa). In these variations, the first word means big or large, the second means river. Oddly enough, the Winnebagoes referred to it as Nekoonts Haktakahagain, the two words meaning Large and River. The Sioux, on the other hand, called it Wapta-Tonga, with the two words once more signifying Big and River.